Size: 1" to 1 1/2"
Identification: Solitary, shiny blue-black wasp that builds mud nests on the sides of buildings. Their heads are wide, and their waists are thread-thin. Biology and life cycle: Adult female wasps paralyze insects and other wasp prey by stinging. They then lay an egg on them and store them in a cell of the mud nest. The larvae feed on the living tissue of the stored insects. Habitat: Most flowering plants and food crops. Feeding habits: Female adults hunt and paralyze spiders, crickets, cicadas, flies, and leafhoppers. Before sealing each egg cell, she drops a spider in to feed the larva later. Adults like flowers and feed on nectar and pollen. Economic importance: Control of spiders, especially black widows. Insight: Extremely beneficial insects. Their favorite food is the black widow spider. When the mud dauber catches spiders, she doesn't kill them. The sting paralyzes the leg muscles so the spider can't move. She then carries them to a mud chamber, lays an egg with the spider, and seals the chamber. Her egg hatches into a wasp larva; the larva crawls among the spiders, eating their leg muscles first. The larva doesn't feed on the spider bodies until last, so the spider remains alive longer. The cicada killer (another beneficial wasp) is a close relative of the mud dauber. 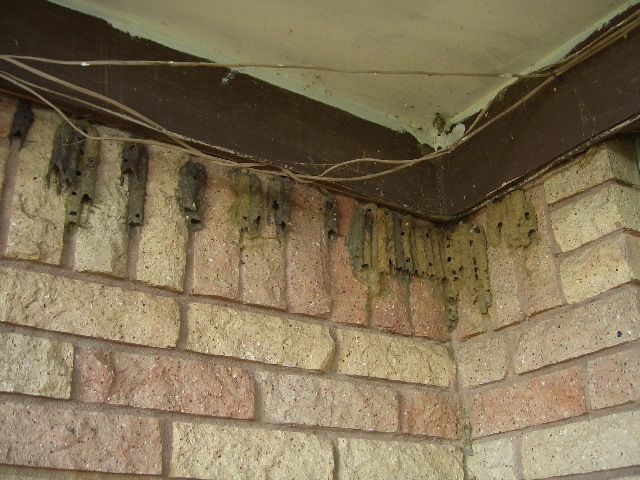 It's OK to destroy mud dauber nests if holes are present. The holes indicate that the new adults have emerged. The mud nests are not reused.